My visit to Bangalore is part business-trip part vacation. Traveling with me on business is a German colleague whose eyes reveal a side of the city I usually gloss over. On the first day, he is puzzled by the security measures at the hotel entrance. Our bags are scanned, the contents of our pockets verified, and we pass through a metal detector. The shopping mall attached to the Marriott has another checkpoint. Why so many security checks here, he asks, when everything seems normal outside? It is his first visit to the country. On the afternoon he arrives, he takes an auto-rickshaw to Bangalore Palace, and later sends me a picture of the rickshaw on WhatsApp. He is curious about Indian food, but soon runs into “stomach issues due to the spice.” At the restaurant, he tries to make sense of the waiters in the scene, some flitting from table to table, others hanging around doing nothing, and a few just giving orders to others. In the evening he goes looking for mineral water — the bottles in his room are exorbitantly priced — but the nearby BigBasket outlet has no stock. In another supermarket at another mall he picks up four water bottles — it is all they have. Why do supermarkets here not stock water? he asks. I am equally puzzled. But I am not puzzled when the security guards ignore me and wish him Good Morning. And it is no surprise to see the Crossword bookstore attendant approach him with a greeting and ask if he needs help. Why didn’t he ask you, my colleague wants to know. Because I’m not white, I tell him. Wishful thinking, I’d say. My excuse for the silence here is untypical. I’ve been writing fiction. My situation isn’t this extreme. If Zadie Smith’s condition is a malarial fever, mine is an ordinary mosquito bite. But the bite consumes a good portion of my attention each day. I live in my fictional world for long periods, among characters and situations that exist only in my head. (It is a form of madness.) Ideas and leads turn up at unlikely moments, and I know I cannot follow them all, because this is a short story, not a novel. But things can get out of hand. Short stories can turn into novellas, novellas into novels. I cannot control this. Right now I’m following my instincts the way a leashed dog follows his master. I only know where the next few steps go. Beyond that, it’s a mystery. The other day we were in Frankfurt for lunch in a South Indian restaurant. It had opened not long ago, and some friends had dined there, Facebooking the culinary experience. Social pressure of this kind is hard to stomach. We drove a hundred kilometers for vada and dosa. The place was chock-full of Indians. The cooks, visible through a glass partition, were Indian; the waiters and waitresses, dressed in dark jeans and white shirt, were Indian; the diners were all noisily Indian. It was odd, stepping into a place like this. We’ve grown used to appearing different from others around us, and here we were all looking same same. The first few moments were terrifying. Then it struck me that we weren’t really like the other Indians there. The immigrant always considers himself a different breed. The waitress taking our order, a short young woman with two plaits, was humble, soft-spoken, diffident. Unlike German waitresses in a German restaurant. Or Indian waiters at established Indian restaurants here. She was new to the country, it was clear, and in this setting she was a pleasant reminder of a certain kind of people back home. This attitude, it seemed, was taken as an invitation by some customers. At two tables nearby the waitresses were spoken to in harsh tones. Common in India, unheard of here. The immigrants had reverted to their original colours. Dosa was good, vada less so. But this was no time for complaint: South Indian food is hard to come by in Germany (most Indian and Pakistani restaurants serve only North Indian cuisine). We were happy, we ate well. In the men’s room — dingy, wet-floored — there was a short queue at the wash basin. The man behind me stood rubbing my back. After I finished washing he pointed me to the napkin dispenser next to the basin: there, he said, the napkins are there. In all, a refreshing experience. How boring the Germans can be in comparison, and how I long at times for unpredictable behaviour from others. To be surprised, occasionally, keeps you alert, active. The UK and the US have their Little Indias; the Germans now can boast of a Saravana Bhavan in Frankfurt. Earlier in September we celebrated Onam. 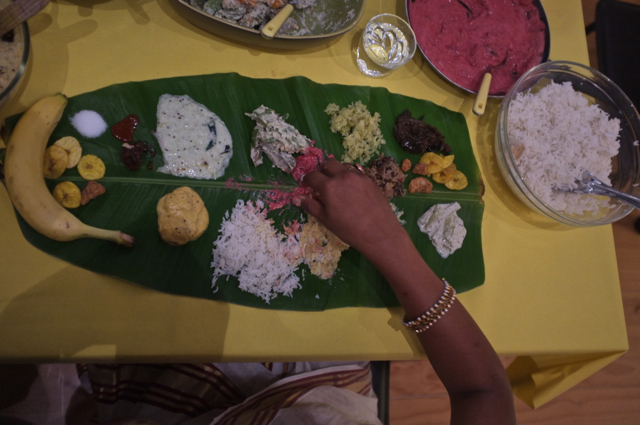 Four families came home for a sadya — a feast, prepared in parts by everyone. The celebration is an yearly affair, but this time the immigrants had a fresh claim to authenticity: the sadya was served on plantain leaves. Wife had returned from Singapore not long before, smuggling on board Lufthansa a dozen or so crisp leaves. Our conclusion was unanimous: the meal tasted better on leaves than plates. We ate not on the floor but at the dining table, taking turns, the men going first (served by the wives), the women following after. Tradition did not shape this sequence: space on the dining table was limited. The ritual was altered. Since open-air cremation is forbidden by the health authorities, Hindus are buried, not cremated. Their ashes are not taken down holy rivers into the ocean to become again part of the Absolute. There is no Ganges at hand, only a muddy stream called the Caroni. And the water that the Hindu priest sprinkles with a mango leaf around the sacrificial fire is not Ganges water but simple tap water. The holy city of Benaras is far away, but the young Hindu at his initiation ceremony in Port of Spain will still take up his staff and beggar’s bowl and say that he is off to Benaras to study. His relatives will plead with him, and in the end he will lay down his staff, and there will be a ritual expression of relief. It is the play of a people who have been cut off. To be an Indian from Trinidad, then, is to be unlikely and exotic. It is also to be a little fraudulent. But so all immigrants become… Immigrants are people on their own. They cannot be judged by the standards of their older culture. Culture is like language, ever developing. There is no right or wrong, no purity from which there is decline. Usage sanctions everything.